It's 1666 and the Great Fire has just decimated an already plague-ridden London. Lady's maid Lucy Campion, along with pretty much everyone else left standing, is doing her part to help the city clean up and recover. But their efforts come to a standstill when a couple of local boys stumble across a dead body that should have been burned up in the fire but miraculously remained intact—the body of a man who died not from the plague or the fire, but from the knife plunged into his chest. Searching for a purpose now that there's no lady in the magistrate's household for her to wait on, Lucy has apprenticed herself to a printmaker. But she can't help but use her free time to help the local constable, and she quickly finds herself embroiled in the murder investigation. It will take all of her wits and charm, not to mention a strong stomach and a will of steel, if Lucy hopes to make it through alive herself. 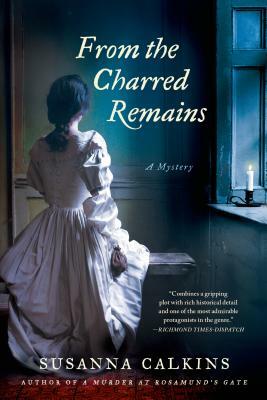 With From the Charred Remains, Susanna Calkins delivers another atmospheric historical mystery that will enchant readers with its feisty heroine and richly detailed depiction of life in Restoration England.